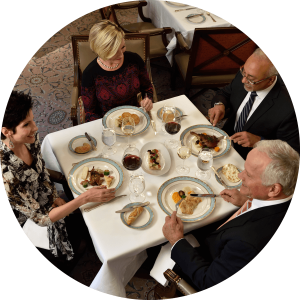 Nowhere is passion more alive than in the fine dining and superb menus presented daily at the Duquesne Club. Membership provides a sense of place, including seven à la carte and 25 private dining rooms offering delectable fare and personalized service, Monday through Saturday. Traditional specialties and innovative contemporary cuisine are prepared by a creative brigade of chefs and cooks using the finest, freshest components secured from local purveyors and international artisans. Executive Chef Keith Coughenour and his talented team transform these ingredients into culinary masterpieces, to the gastronomical delight of members and their guests.